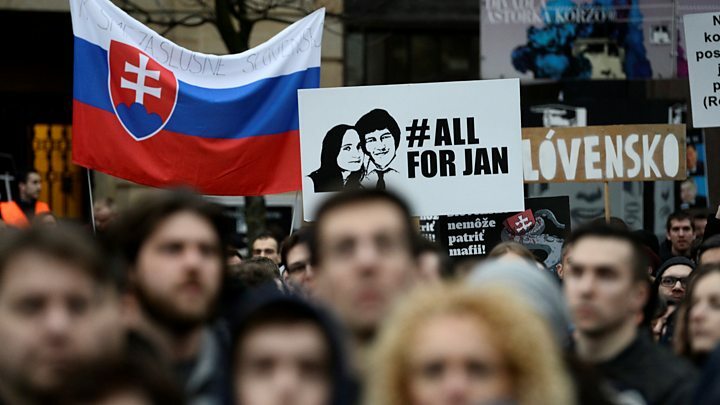 Thousands have attended protest rallies across Slovakia in memory of murdered journalist Jan Kuciak and his fiancée, shot in a targeted killing a year ago. He had been investigating alleged corruption linked to Italian organised crime – a story which would, after his death, bring down the government. 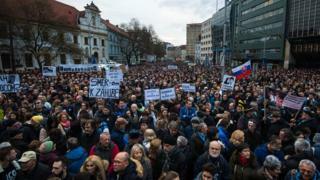 About 25,000 people rallied in the capital Bratislava. It remains unclear who ordered the killing of Kuciak and Martina Kusnirova, both aged 27 at the time. While the Bratislava rally was very much an act of remembrance for them – there were Slovak chorales and a sermon by a priest – it was also a political protest. Demonstrators cheered as organisers called on the political old guard to resign – a group including former Prime Minister Robert Fico, who remains an MP and head of the governing party. One of the first to speak was Jan’s father Jozef. “Everyone can make their own judgement about what kind of democracy we’re living in, and from whom we should seek justice,” he said. Protests were held in more than 50 towns and cities across Slovakia. It was the first such targeted killing of a journalist in Slovak history. Three men and a woman are in custody. The Slovak authorities, who refer to the suspects by initials only, say three are accused of first-degree murder. But the prosecutor is still working on the case, and there is no date set yet for a trial. The Slovak media, which name the suspects in full, have described their alleged roles in detail: who watched the couple’s home in the small town of Velka Maca; who drove the Citroen Berlingo car; who fired the Luger 9mm that killed them, first Kusnirova with a single bullet to the temple and then Kuciak with two rounds to the chest. “Two days before Jan’s murder, I sent him a text asking if he felt in danger and offering to hide him,” said Peter Bardy, editor-in-chief of aktuality.sk, the news outlet which employed Kuciak as an investigative reporter. “He texted back to say no, he didn’t have this problem. And two days afterwards he was killed. One year on, there is still a small shrine to Jan and Martina on the ground floor of the nondescript high-rise building in Bratislava that houses Aktuality’s editorial offices. Three dozen red candles sit on a clean white tablecloth, illuminating framed black and white photographs of the pair. It’s a reminder that as well as being an event that convulsed Slovak society – Prime Minister Robert Fico resigned after three weeks of mass demonstrations – the deaths were a personal tragedy. Kuciak was young, idealistic, and well-liked. The pair were due to be married in the spring. Kusnirova, an archaeologist, was buried in her wedding dress. Ask any journalist, or indeed anybody in Slovakia, and no-one believes that 44-year-old “AZ” – the glamorous Italian-Slovak translator alleged by prosecutors to have paid a former police officer €50,000 (£43,000) to murder Kuciak – is the person who ultimately ordered the killing. Kuciak wrote about many things – corrupt Slovak businessmen, EU subsidy and VAT fraud, and Calabria’s notorious ‘Ndrangheta crime syndicate and its attempts to cultivate ties with Slovak politicians. But he never wrote about AZ. Across town, at the journalism faculty of Bratislava’s Comenius University, the first class of the spring semester started with a minute’s silence for the pair. The room was full of MA students attending a lecture on investigative journalism. “Journalists have this immense power to change things,” said Alena Markova, a 23-year-old student from the spa town of Piestany. Most of her fellow students said they planned to attend the anniversary rallies on Thursday. None appeared intimidated by Kuciak’s killing. Who is burning down Rohingya villages?